NAIROBI, Kenya, Dec 12 2016 (IPS) - Reengineering the framework of support by bringing in women as new actors in effective development cooperation will play a pivotal role in achieving the 2030 Agenda for the Sustainable Development Goals (SDGs). “We need to deliberately make sure that women are part of the development agenda,” Stephen Gichohi, country manager at Forum Syd’s office in Kenya, told a recent Nov. 28-Dec. 1 Second High Level Meeting (HLM2) on the Global Partnership for Effective Development Cooperation (GPEDC) in Nairobi. 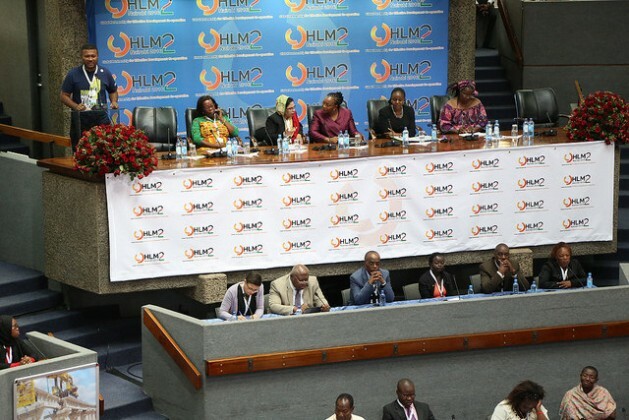 The HLM2Nairobi meeting brought together over 5,000 delegates from across the globe, and saw a 400 delegation Civil Society Organisations Partnership for Development Effectiveness (CPDE) endorse the Nairobi Outcome Document. “Through the government of Kenya’s hosting of this meeting and its leadership, stronger language on gender equality, women’s empowerment and youth’s role in development was made possible,” Theresa Nera-Lauron, co-chair and CSO Policy Advisor, Effective Development Cooperation told IPS. The HLM2Nairobi built on the Rome Declaration on Harmonisation (2003), the set of principles adopted in the Paris Declaration on Aid Effectiveness (2005), the Accra Agenda for Action (2008), the Fourth High Level Forum on Aid Effectiveness in Busan (2011) where the Global Partnership for Effective Development Cooperation (GPEDC) was born, and the outcome of the First High-Level Meeting of the GPEDC in Mexico City (2014). Patricia Akakpo, Programme Manager, Network for Women Rights in Ghana (NETRIGHT), says despite progress on gender equality and women’s rights, much needs to be improved. “The general CSO concern, for instance, on democratic ownership is not about shared ownership. The shrinking space of women’s rights and a backlash on gains made in gender and women rights clearly reveals that more needs to be done,” Akalepo told IPS. She says gender-responsive budgeting has been sector-specific, coupled with failure of the governments to meet commitments on gender equality and women’s empowerment. “If you look across countries, institutions working on gender equality and women’s rights issues are the least funded. Gender ministries are the least funded. Feminists organizations don’t have the funds to organize to advance women’s rights,” she says. This comes in the wake of concerns regarding the failure of development support to marry country development policies. “We need to look at quality for development cooperation and aid in general as countries have been getting much on development support, but little concern is given to whether the support marry with the country development policies, such as the Vision 2030 for Kenya, “said Gichohi. Kenya’s President Uhuru Kenyatta reiterated the need to include all sectors of the population in the development and implementation of the socio-economic agenda. “We are happy that the topic of incorporating women, youth and persons with disabilities in the development cooperation has raised big interest in this meeting. We must chose to champion the economic empowerment of women and youth in recognition to the potential they can contribute to the Agenda 2030,” said Uhuru when he opened the HLM2Nairobi meeting. “HLM2Nairobi focussed on women and youth, a population largely left out. Nothing about us without us. We must involve the voices of youth and women in the development agenda,” Memory Kachambwa, Programme Manager for the African Women’s Development and Communication Network (FEMNET), told IPS in an interview. Reacting to President Uhuru’s sentiment, Kachambwa reiterated the need for policymakers to stop viewing women as victims, and rather as agents of change in their own right who should influence the aid agenda. Africa, a continent endowed with rich natural resources – especially from the extractives sector – has borne the brunt of tied aid and illicit financial flows, but concern was also raised about the impact of it on the women. “For every one dollar that comes through development aid, 10 dollars leaves African countries. African has natural resources, but cannot be accounted for, and has been the interest of donor countries which have Multi-National Companies. Governments need to work on certain jurisdictions that provide multinational companies loopholes for tax avoidance,” said Kachambwa. In a report last year, the Organization for Economic Cooperation and Development (OECD) said that companies and government officials are skimming as much as 60 billion dollars annually though illicit financial flows. “The 60 billion dollars lost through illicit financial flows from African continent is much more than the aid being received. Women are disproportionately affected. This shows there is more in utilizing local resources to fund development in the developing world,” Angel Gurria, OECD Secretary General, told IPS in an interview. With women facing the harsh reality of fragility in states witnessing violence, Kachambwa calls for linkages with instruments such as the UN Security Council Resolution 1825 and Beijing Declaration. “Women’s leadership, active participation and influence on different levels in society is important for a sustainable development and a strong democracy,” says Lisbeth Petersen, head of the International Programme Department at Forum Syd. Yes, a chilling reminder, when one considers that forcing females all over the earth to be baby machines, and denying the girls the opportunity to get skills that will allow them to earn their living, increases our global problems. When these forced mothers get left with their children, they are in poverty because they do not have the skill, nor the right socially to be a breadwinner. When the woman is helped she often sends the benefits straight back to her kids. Sometimes she is badly beaten for supporting her daughter against child marriage, or to go to school. The condition of females in every country in the room is the biggest shame, as they are half of humanity and all of our mothers.